Kitchen : Bread pudding with apple pie and caramel, it's almost too good! 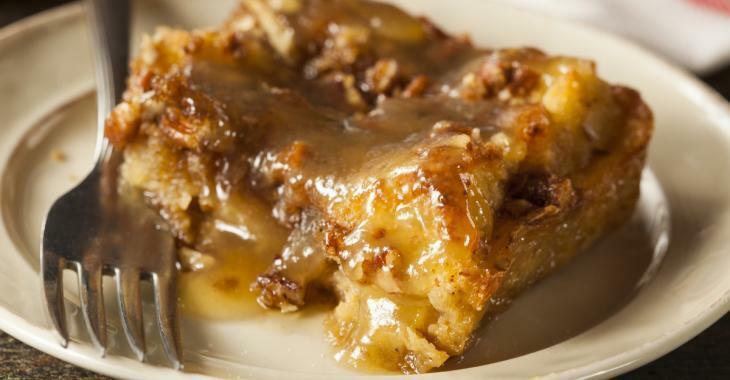 Bread pudding with apple pie and caramel, it's almost too good! My autumn version of the famous bread pudding! You will certainly add this recipe to your favorites! Preheat the oven to 350 degrees F and butter a 9 x 13 inch dish. In large bowl, whisk yogurt, milk, eggs, 1 tsp. cinnamon, nutmeg and ½ cup sugar. Stir in apples, raisins, then bread cubes. Pour into the prepared dish. In a small bowl, combine 2 tsp. sugar and 1 tsp. of cinnamon. In a saucepan, combine butter, cream and brown sugar; bring to a boil. Reduce heat and simmer until sauce thickens, about 5 minutes. Pour over the hot bread pudding.